Tires with deep patterns like the one seen here do the cyclist no favors. They trap glass and rocks. However, Avocet knew better and had the test results to prove superior traction on dry and wet roads. After a time Avocet tires caught on, despite some difficulties in buying from the company. When Avocet went out of business, so went the tires. Some tire companies have adjusted their product line to include smooth-pattern tires, but still include pattern tread in other models, including Continental. Michelin tires are pretty much all smooth and Bontrager sells smooth and pattern tread. These patterns do absolutely no good in rain. Hydroplaning is something car tires experience, not bike tires. 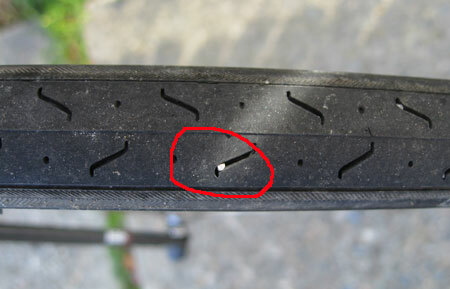 Bike road tires have about an inch of contact and cannot trap water. One tire I saw recently has deep patterns, which attract small rocks and glass shards. While smooth tires will pick up grit and glass too, a deep pattern encourages this undesirable event. This entry was posted on November 27, 2011 at 2:46 pm and is filed under Products. You can follow any responses to this entry through the RSS 2.0 feed. You can leave a response, or trackback from your own site. Thanks for this. The Avocets were great because they were slick and available in wider, useful sizes instead of the 22mm tires that the wannabe racers use now. And they had great traction and were affordable. Have you tried any of the tires you mention? The Bontrager R1 looks worth a try, despite the low thread count and unknown tread compound. I have Bontrager but it has some small patterns. I just noticed they sell smooth, so I’ll see if if fits my needs. I like 28mm best, but can use 25.